The Qtopia namespace contains miscellaneous functionality. A list of words relevant to the current locale is maintained by the system. The list is held in a QDawg. This list is used, for example, by some input methods. The global QDawg is returned by fixedDawg(); this cannot be updated. The addedDawg() contains words that have been added by addWords(); this dawg is also referred to as dawg("local"). The dawg("deleted") contains words that are in the fixedDawg() but which the user has explicitly deleted, using removeWords(). The dawg("preferred") contains words that are in either fixedDawg() or dawg("local") and which the user has explicitly marked as preferred to other words, for example, for the purpose of some input methods. Applications may have their own word lists stored in QDawgs which are returned by dawg(). Use addWords() to add words to the modifiable copy of the global QDawg or to named application QDawgs. Applications should consider the namespace of the word lists, prefixing with the application name where appropriate. These methods return the authoritative values of run-time paths used by various components of Qtopia. In general do not use these methods. Instead use the QContent API, or the Qt Extended Resource System. Qt Extended is designed so that searching or scanning the file-system should not be necessary. When it is necessary to determine locations on the file-system, use homePath() to find the location for user settings, documentDir() for user documents, and helpPaths() to locate all help files. Use installPaths() to find all possible install paths, for example to locate a binary resource. Use qtopiaDir() for the default location for resources, and packagePath() as the location for third-party resources. The installPaths() method gives the complete list of paths known to the Qt Extended run-time system. The updateDir(), qtopiaDir() and packagePath() directories are stored as the first, second and last components of this list. In fact the paths are determined by compile time configuration options. Qtopia::AdditionalDecorationRole 1000 An additional decoration to display status, for example. Qtopia::UserRole 2000 The first role that can be used for application-specific purposes. This enum controls what type of locking is performed on a file. Qtopia::LockWrite 2 Create a write lock. Qtopia::LockBlock 4 Block the process when lock is encountered. Under WIN32 this blocking is limited to ten(10) failed attempts to access locked file. Reserved for future use. Displays a message dialog containing the specified pixmap and text for a short time. Schedules an alarm to go off at (or soon after) time when. When the alarm goes off, the Qt Extended IPC message will be sent to channel, with data as a parameter. If channel does not contain the / character, it will be interpreted as a QCop service name. For example, specifying Calendar as channel will direct the alarm to the configured calendar program. Note that these alarms fire regardless of whether the application that created them is running, indeed for some hardware, even if the device is not powered on. If this function is called with exactly the same data as a previous call the subsequent call is ignored, so there is only ever one alarm with a given set of parameters. Adds wordlist to the addedDawg(). Words that are already in the "local" list are not added. Words that are in the "deleted" list are removed from that list. Note that the addition of words persists between program executions (they are saved in the dictionary files), so you should confirm the words with the user before adding them. This is a slow operation. Call it once with a large list rather than multiple times with a small list. Adds wordlist to the dawg() named dictname. Returns the changeable QDawg that contains general words for the current locale. See also fixedDawg(), addWords(), and removeWords(). Returns the application data path for the application specific data file filename and the application executable named appname. Application specific data is stored in a separate directory per application. The application specific directory will be created if if does not exist. It is a requirement that the user has write permissions for Qtopia::homePath(). In the case of a package installed under SXE, then typically that package will not have access to Qtopia::homePath(). Instead the package is sandboxed into an application specific directory given by Qtopia::sandboxDir(). In that case this method returns a path under the sandbox directory. If filename contains "/", it is the caller's responsibility to ensure that those directories exist. Returns the device architecture string specified by QPE_ARCHITECTURE. This is a sequence of identifiers separated by "/", from most general to most specific (eg. "IBM/PC"). If a value has not been set for QPE_ARCHITECTURE the string "Uncusomized Device" is returned. If parent is 0, the dialog becomes an application-global modal dialog box. If parent is a widget, the dialog becomes modal relative to parent. Returns true if the user agrees to deleting object; otherwise returns false. Returns the QDawg with the given name. This is an application-specific word list. name should not contain "/". If name starts with "_", it is a read-only system word list. language allows the specific selection of a dictionary for a particular language. This option applies to read-only system word list only and is ignored otherwise. If no language is given the dictionary of the current language is loaded. Returns the string equivalent to s, but with any soft-hyphens removed. Deletes previously scheduled alarms which match when, channel, message, and data. Passing null values for when, channel, or for the Qt Extended IPC message, acts as a wildcard meaning "any". Similarly, passing -1 for data indicates "any". If there is no matching alarm, nothing happens. Returns a unique ID for this device. The value can change, if for example, the device is reset. Returns the user's current Document directory, with a trailing "/" included. Finds a font that can be used to display the string s and returns a variant with this font value. If the string cannot be displayed by any of the installed fonts, an invalid variant is returned. If s is empty, this returns a variant with the default font. Returns the unchangeable QDawg that contains general words for the current locale. Returns true if key is available on the device. The buttons may be either fixed function buttons, such as Key_Menu, or user mappable buttons, such as Key_F1. See also Qt::Key, QSoftMenuBar, and QDeviceButtonManager. Returns a list of directory names where help files are found. Returns the name of the directory to be used as the current users home directory. Returns the list of base directories containing Qt Extended software and resources. Some directories in the list, or their sub-directories, may not be writable. Internally the second element is equal to [qt_prefix] and additional values are set by the colon-separated environment variable QTOPIA_PATH. The Qt Extended algorithm for locating resources searches the paths in order so that for example downloaded binaries or resources cannot overwrite system resources. Note that qtopiaDir(), the default location for resources and binaries is second on this list, and packagePath() is last. See also qtopiaDir() and packagePath(). Returns true if file is the file name of a document ie, it resides under the locations described in storage.conf marked with both Documents=true and possibly with an extra document path for the location. Tests locking a file. Any locks created should be released before the program exits. Returns true if locking would be successful. f must be an open file. flags any combination of LockShare, LockWrite. See also Qtopia::unlockFile() and Qtopia::lockFile(). Returns whether word is in the fixedDawg() or the addedDawg(), but not in dawg("deleted"). Returns the list of language identifiers for currently selected language. The first string in the list is the identifier for user's primary choice of language. The second string in the list, if any, is more generic language, providing fall-back policy. For example, "en_US", "en" is returned when American English is used. If there is no translation in "en_US", more generic translation "en" will be used. Lock a file. Any locks created should be released before the program exits. Returns true if successful. f must be an open file. flags any combination of LockShare, LockWrite, LockBlock. See also Qtopia::unlockFile() and Qtopia::isFileLocked(). Returns true if keypad navigation is disabled and the application can expect the user to be able to easily produce mouse events. Returns false if keypad navigation is enabled and the user cannot produce mouse events, or chooses not to (eg. does not plug in a mouse). Applications may use this to tune interactions. Note that you should only call this function after an instance of QtopiaApplication has been created. This function will return an undefined value if called prior to this. Suspends the current process for msecs milliseconds. Note that this function should be avoided where possible as it will freeze the user interface. Use of QTimer and QObject::startTimer() allow for delayed processing without freezing the user interface at the cost of being unable to trigger accurately. Returns the name of the owner of the device. Returns the base directory in which downloaded 3rd party packages, including their binaries and resources, are located. This is returned as the last item in the installPaths() list. The value of packagePath() is determined by the [Packages] group in the Storage.conf file. The directory must be writable, and is used by the Software Installer for installation of downloaded software. Returns the base directory in which Qt Extended system binaries and resources are located. This is the default location for all Qt Extended configuration and other data. This directory may not be writable. This is the second item in the installPaths() list. See also updateDir() and installPaths(). Reloads the QDawg named called dictname. This must be called if the underlying dawg files are changed, otherwise previous versions will be used. Removes wordlist from the addedDawg(). If the words are in the fixed dictionary, they are added to the "deleted" dictionary. Removes wordlist from the dawg() named dictname. Find the full path to the directory into which the current process is sandboxed under SXE. The current process will have full read and write permissions in this directory. 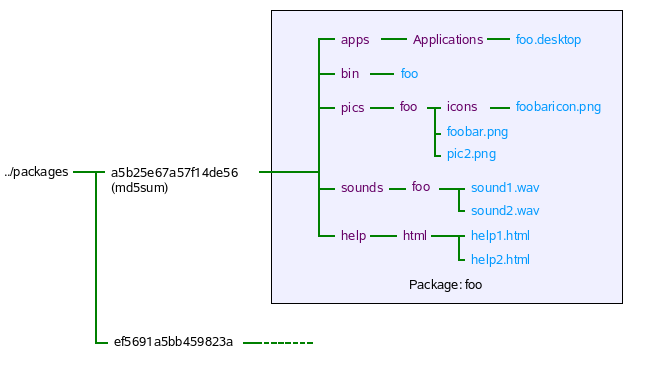 This diagram shows a typical layout for the sandbox resulting from an SXE package install. Sets the day the user regards their week starting on. If v is true, then the week begins on Monday. If v is false, then the week begins on Sunday. Returns the string s with the characters '', '"', and '$' quoted by a preceding '', and enclosed by double-quotes ("). Returns the result of using QString::simplified() on multiLine, but with line breaks preserved. Suspends the current process for secs seconds. Sounds the audible system alarm. This is used for applications such as Calendar when it needs to inform the user of an event. Returns the string s with the characters '' and '"' quoted by a preceding ''. Returns the default system path for storing temporary files. The path is unique to the display to which the application is connected. The path has a trailing directory separator character. The returned directory is created if it does not exist. Returns a file name suitable for use as a temporary file using fname as a base. Currently returns the file name with "_new" inserted prior to the extension. No attempt is made to check that the file does not already exist. Translate str in the context c, using only the translation files defined by key. The key may be either a single name, such as "QtopiaSettings", or it may be a 'wildcard', such as "Categories-*". The key thus defines the set of translation files in which to search for a translation. Returns true if able to truncate file to size specified f must be an open file size must be a positive value; otherwise returns false. Unlock a file. Returns true if successful. f must be an open file previously locked. See also Qtopia::lockFile() and Qtopia::isFileLocked(). Returns the directory in which Qt Extended system updates are installed to. Binaries and resources located in this location are used in preference to those located in the directory returned by qtopiaDir(). This is returned as the first item in the installPaths() list. The value of updateDir() is determinted by the [Updates] group in the Storage.conf file. The directory must be writable, and is used by the Software Installer for installation of downloaded system updates. This is the first item in the installPaths() list, and as such is the first location searched by the Qt Extended resource system, and the algorithm for locating binaries for execution. See also qtopiaDir() and installPaths(). Suspends the current process for usecs microseconds. Returns the Qt Extended version string, specified by QPE_VERSION. This is of the form: major .minor .patchlevel (eg. "1.2.3"), possibly followed by a space and special information (eg. "1.2.3 beta4"). Returns true if the user regards their week as starting on Monday. Returns false if the user regards their week as starting on Sunday. Writes the system clock to the hardware clock.